I love all the designs from Tinyowlknits Her whimsical designs conjure up a magical world. But surely one of Stephanie’s most successful designs is the Beekeepers quilt. 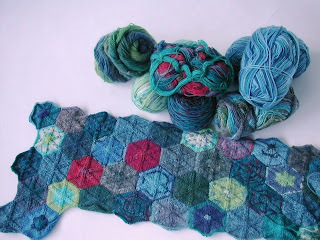 Everyone is talking about Hexapuffs. My timing must have been a bit out because I was just about to start a Heathen Housewife mitred square blanket when the Beekeepers quilt launched and I was torn. Two fantastic patterns, both using up those frustrating little lengths of sock yarn. In my head the two ideas collided and suddenly I was knitting Hexagons and picking them up as I went along like multiplying cells. As you can see, the colours I have in my stash create a origami/Japanese effect. I haven’t decided what this is going to be yet, but I am working with 7 hanks of yarn, so let’s see how far I get. The pattern is very simple and I will put it on Ravelry as soon as I have finished. This is the best thing I have seen for a long time. Absolutely beautiful- well done you!